FILE - The militant group's leadership vowed that "every possible tactic will be utilized in order to detain or inflict heavy casualties on the foreign transgressors," including suicide attacks on military bases and diplomatic areas. The Taliban on Saturday announced the start of their spring offensive, signaling plans to step up attacks as the weather warms across Afghanistan, making both travel and fighting easier. The statement comes toward the end of a month that already has been the deadliest of the year. The militant group's leadership vowed that "every possible tactic will be utilized in order to detain or inflict heavy casualties on the foreign transgressors," including suicide attacks on military bases and diplomatic areas. The leadership also threated more so-called insider attacks by members of the Afghan security forces against their colleagues or foreign troops. Such attacks threaten the strength of the Afghan forces as they work to take over responsibility from international troops. The latest one occurred in March, when a member of Afghanistan's government-backed militia program shot and killed five of his colleagues in Badghis province in northwest Afghanistan. In a sign of Taliban's determination to replace Afghanistan's government with one promoting a stricter interpretation of Islamic law, they named their new offensive after a legendary Muslim military commander, Khalid ibn al-Walid. Also known as "the Drawn Sword of God," he was a companion of Islam's Prophet Muhammad. Afghanistan's defense ministry responded by saying its security forces are prepared for Taliban's new campaign. "The Afghan National Army is ready to neutralize the offensive," the ministry said, adding that the soldiers now have the support and trust of many Afghans. In another development, a NATO aircraft crashed in southern Afghanistan on Saturday, and coalition forces were securing the site, the International Security Assistance Force said. Its brief statement provided no information about where the crash occurred or if there were casualties, but did say there was no indication it was downed by insurgents. Mohammad Jan Rasoulyar, deputy governor of the southern Zabul province, said a helicopter belonging to foreign forces crashed on Saturday afternoon in the district of Shah Joy. He confirmed that the site was surrounded by foreign forces but had no information on the cause of the crash or whether anyone was hurt or killed. The new Taliban offensive comes as U.S.-backed efforts to try to reconcile the Islamic militant movement with the Afghan government have so far failed. Insurgents already have intensified attacks this spring as they try to position themselves for power ahead of national elections and the planned withdrawal of most U.S. and other foreign combat troops by the end of 2014. April has already been the worst month for combat deaths so far this year. According to an Associated Press tally, 257 people — including civilians, Afghan security forces and foreign troops — have been killed in violence around the nation. During that time 217 insurgents have died. Still, the top U.S. commander in Kabul, Marine Gen. Joseph Dunford, said Wednesday that the security situation has improved across the country, with Afghan forces now leading 80 percent of all conventional operations. "As the traditional fighting season begins, the insurgency will confront a combined " Afghan force of 350,000 soldiers and police, he said. "The insurgency can no longer use the justification that it is fighting foreign occupiers — that message rings hollow," Dunford said in a statement. 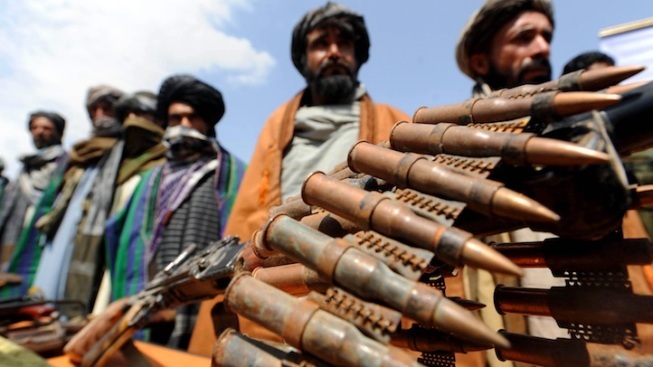 Meanwhile, late on Friday, the Taliban freed nine civilian de-miners it had captured in the southern province of Kandahar after negotiations involving tribal elders, provincial spokesman Javeed Faisal said. The Afghan men were being driven back from a minefield last Sunday when they were captured. Afghanistan has a legacy of land mines going back decades and remains one of the most heavily mined countries in the world.